Or, maybe not that recently, I am very behind. I read an ARC of this, it’s out in September. Seriously, it’s excellent. When a team of Australian scientists–and a lone historian–travel back to St-Guilhem-le-Désert in 1305 they discover being impartial, distant and objective just doesn’t work when you’re surrounded by the smells, dust and heat of a foreign land. They’re only human after all. I have to admit I’m mostly not a fan of time travel stories. For various reasons, but this one really worked for me, not least because Gillian is an actual historian. Also, since I’m actually really, truly done with revisions on The Raven Tower, I decided to indulge myself and actually…re-read a book! Which I haven’t been able to do for a very long time, even though I used to read favorites over and over again, way back in the day. Anyway, I went back and read The Goblin Emperor again and it was just as good the second time, if not better. Sorry, I haven’t been blogging at all lately! I’ve been doing lots of other things–revisions on The Raven Tower and a short story for an anthology, and more stuff that’s not worth mentioning here. But! Worldcon approaches! And I will indeed be in San Jose. You can see the whole schedule here (though I’d check it a few times between now and the convention, I gather it might well need some updating in the next few days, for various reasons, and I’d like to give a shoutout to Mary Robinette Kowal and her fabulous team). Spend an hour talking about pronoun and identity variations, and why they matter to our fellow fans. How do we ask about pronouns? What possible pronouns are there? How can we make our fannish spaces more inclusive when we write, name, and interact with other fans? Listen to some of this year’s Hugo Novel finalists as they share their work. So there it is, that’s where you can find me at Worldcon this year. And do please feel free to say hi if you see me around. I can’t promise I’ll have much time to stop and chat, if I’m on my way somewhere with a definite time attached (which can happen at a con), but I do want to see you! Also I plan to have badge ribbons for folks who are interested in that. I’ve been neglecting the blog, sorry! I’m head down in revisions for The Raven Tower. But I’ll be some places in St Louis over the next couple of weeks! This coming Wednesday I’ll be at Left Bank Books–not for myself, but to chat with Chandler Klang-Smith, author of The Sky Is Yours. It’s a fascinating book, and I think it will be a great evening. I gather Left Bank is planning to do more SF-related evenings over the coming year, so you might want to keep an eye on that! 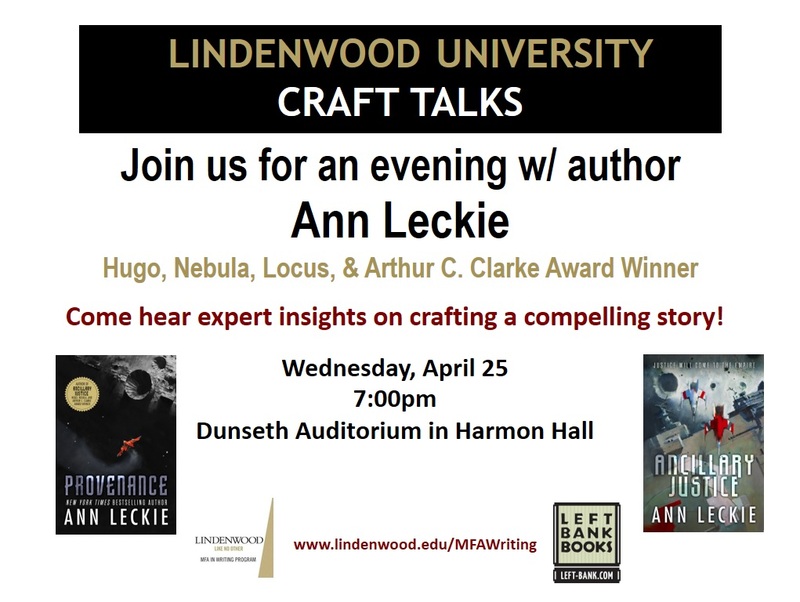 Left Bank Books and Archon present an SF STL event with Chandler Klang Smith, who will sign and discuss her new novel, The Sky Is Yours, with St. Louis science fiction author Ann Leckie! Hey, everybody, look at this awesome list of finalists for this year’s Nebula Awards! It’s full of either stuff I’ve read and loved, or stuff I’m really looking forward to reading! Followers of this blog will recognize a few titles as things I’ve recommended in the recent past–like Fonda Lee’s Jade City, and J.Y. Yang’s Black Tides of Heaven. And Martha Wells’ All Systems Red! Over at File 770, JJ has a list of the nominees with links to free, online excerpts or full copies of the finalists, so check that out for some great reading. I couldn’t be happier with this group of finalists. Congratulations, all, and for those of you who are up there for the first time–How wonderful and exciting! Take a deep breath if you need it. You’re all awesome, and I am so delighted for you. Ever since I heard that Nisi was not only working on a steampunk novel set in the Belgian Congo, but that she had gone and sold that novel to Tor, I’ve been eager to read this. I finally got around to it, and I highly recommend it. It’s pretty epic, really, it covers a couple decades in time, from the POVs of a wide variety of characters. Seriously, check this out if you haven’t already. This is a nice anthology of short fiction by authors I’m already a fan of–like Charlie Jane Anders, Keffy Kehrli, and An Owomoyela–as well as authors I’m very happy to be introduced to. I’ve read way too little short fiction lately, and this was an enjoyable first step toward remedying that. These two books were first published in the 1950s and have not always been well-regarded. In the first, the narrator is a young man devoted to drinking palm wine. The person who works tapping palms to bring him that wine dies, and the narrator goes looking for Dead’s Town so he can find the man and bring him back. In the second, a young boy is separated from his family and ends up in the bush, where he encounters lots of dangerous supernatural creatures. Both are picaresque, their plots essentially one adventure after another, and both are told in the first person in a way that feels to me very much as though these stories were meant to be read or spoken aloud. They were written in a variety of English that may take a few pages to get familiar with, but once it’s in your ear it just goes nicely and enjoyably along. I couldn’t find an ebook version, and my nearby libraries didn’t have it,so I bought a used paper copy. It may be in a library near you! BONUS the title of the second novel in this volume may seem familiar if you’ve heard of the Brian Eno and David Byrne album of the same name. If you haven’t heard it, or heard of it, give it a listen. Hey, it’s time for a few things I’ve read and enjoyed recently! First up, the paired novellas The Red Threads of Fortune and The Black Tides of Heaven by JY Yang. This pair of novellas can, I gather, be read in whatever order you like, but if you’ve got a thing about reading stories in story-chronological order, start with Black Tides. This is some excellent fantasy. Each volume centers on one of a pair of twins, children of a powerful ruler who gave birth to them in order to pay a debt to the Grand Monastery. They both learn to manipulate the Slack, the force that underlies all nature, but one, Mokoya, can see the future. Sometimes. Oh, also, Mokoya rides a dinosaur. You want to read these. Seriously. I also scored an advance copy of John Hodgman’s Vacationland. This is autobiographical, and if you enjoy Hodgman’s humor, you’ll enjoy this. I do, and I did. It’s also, in places, quite sincere and not particularly funny, intentionally so. It’s out today, I think. Oh, and if you listen to podcasts but you’re not listening to Judge John Hodgman, you might find it an excellent addition to your regular lineup. Judge John Hodgman always manages to give clear-sighted and compassionate verdicts, despite holding incorrect opinions in the matter of the sandwichness of hot dogs. It was a really enjoyable read! And there appear to be others in the same series, or universe, or whatever, so I might very well pick one of them up next time I need an entertaining break.